Sky Patterson, the vice president of academics for Associated Student Government, presents the “Creating Trans-Inclusive Spaces” guide to senators. 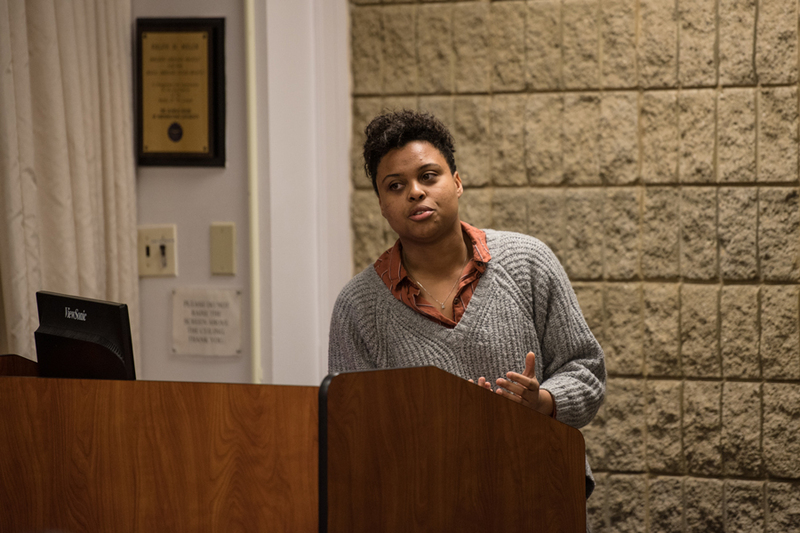 The Wednesday Senate meeting also included elections for an interim parliamentarian. Associated Student Government senators elected an interim parliamentarian and presented a resource guide on promoting inclusivity for non-cisgender students on Wednesday. Patterson said she knows of some professors who have made efforts to be more inclusive by including non-discrimination policies in syllabi. However, she said “there’s still a significant portion of professors that have not gotten onto this wave” of a respectful environment. The one-page guide includes “Dos” and “Don’ts” for professors — for example, do include pronouns in emails and correct mistakes, and don’t assume people’s names or identities. The guide also provides definitions for common terms and resources professors can reach out to with questions. Senators also voted unanimously to elect Communication senior Corey Schwaitzberg as ASG’s interim parliamentarian. Schwaitzberg was previously the Interfraternity Council senator, and IFC will appoint a permanent substitute to take his place in Senate as he serves for the next three weeks of the term. The previous parliamentarian, Justine Kim, resigned for personal reasons after last week’s Senate. Schwaitzberg said that he was previously a member of the Rules and Senate Reform Committees, both of which the parliamentarian is involved with. “Being able to step in as the interim for just a couple of weeks would facilitate a very smooth transition, as people wouldn’t have to get up to speed on all of the committees (Kim was) involved in,” he said. Wellness Week, which was organized by the Health and Wellness committee, will include a speaker, yoga events, a labyrinth walk, and wellness hubs with snacks and stickers.